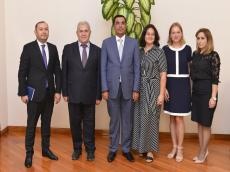 Rector of Baku Higher Oil School (BHOS) Elmar Gasimov held a meeting with representatives of R-Pharm, one of the largest Russian hi-tech pharmaceutical companies. The meeting, which took place at BHOS, was attended by Head of staff training department Ekaterina Repkina, Head of internal communications and corporate culture department Mariya Teplova and HR Manager of the company’s Azerbaijani branch Kemale Bayramova. At the meeting, the prospects for, and fields of, future bilateral cooperation were discussed. As Ekaterina Repkina reported, R-Pharm, which was founded in 2001, employs over 3,600 specialists and has over 60 branches around the world. In her words, the company management is aware of high qualifications of the BHOS graduates and is interested in learning more about the Higher School activities, its curriculum and recruitment experience. She invited BHOS professors and teachers to visit laboratories of the company in other countries and offered to provide them with information about R-Pharm staff training programs. The Head of internal communications and corporate culture department Mariya Teplova emphasized that the company needs capable and talented chemical engineers and process automation engineers. As HR Manager of the company branch in Azerbaijan Kemale Bayramova informed, these specialists are required to work at R-Pharm new chemical plant, which is expected to be put in operation in Azerbaijan by the end of the year. She suggested conducting meetings of the company representatives with the BHOS students and alumni and arranging training and internship programs for them with the view of their future employment. BHOS Rector Elmar Gasimov extended his gratitude to the management of R-Pharm for their interest in developing partnership ties and establishing bilateral cooperation. Having said that cooperation with a pharmaceutical company is a new experience for the institution, he expressed confidence that it would be successful and mutually beneficial. The meeting participants also discussed main provisions of the memorandum on cooperation to be signed in the future, the opportunities to arrange meetings with, and presentations by, the company representatives at BHOS and other issues of common interest.